For Americanized Indian food, come to Chutney Joe's to try the infamous "Bombayritto." 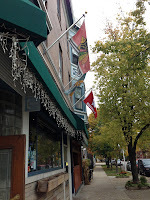 The main location has closed, and the current location is not associated with prior ownership (in fact, they do not want to be associated due to lower quality food). I can see why they don't want to be associated... the food is average at best and the prices are still high enough to be disappointed. Luckily, they are located in Ogilvie Train Station's Food Court, leading to high foot traffic. If you are in the area, and not craving the other places, this may be a restaurant to think about trying. I refer to this unique creation as the "Indian Chipotle." The Bombayritto is a play on the traditional burrito that starts with a huge "roti." I still think they use a burrito tortilla, but I guess it's the thought? Anyway, you can choose an entree that you would like in the burrito and then of course all the other stuffings. So, I had the Chicken Tikka Masala as my entree in my burrito; and I chose to have the basmati rice, onion, jalapeño, lettuce, and the cilantro chutney. 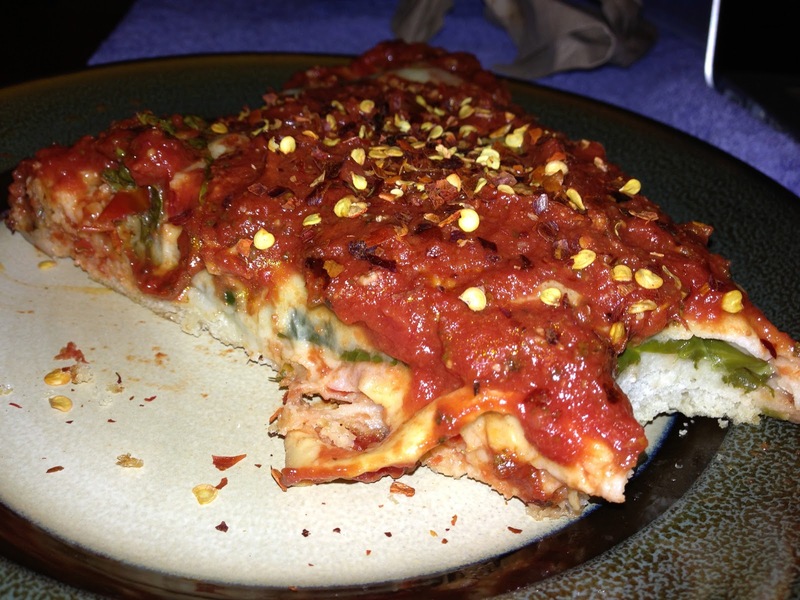 They are fairly generous on the ingredients; maybe a little too generous though on the jalapeño. It was really spicy, even for me... and overall, the food was still just ok. The chicken tikka was more like shredded chicken stewed in the sauce for only a few hours. It didn't penetrate into the chicken and unfortunately some of the larger spices weren't removed so you can get a huge bay leaf or what not in a bite. The cilantro chutney was tasty, but I wish they had more of a variety. My friend decided on the two entree meal. For a little bit more cash, you get a significantly larger meal, which is just average as I have been mentioning. He chose the chicken tikka masala and the palak paneer. It came with a huge helping of the basmati rice and also 1/2 of a naan. As mentioned earlier, the chicken tikka was definitely a below average meal. Too many spices and not enough cooking is not a good combination. The palak paneer was just ok also. The meal was majority cooked down spinach with just a little bit of paneer. The spices weren't as Indian as I was liking, but it will do. The meal is big, so left overs are more than likely to happen. - The best deals are either the bombayritto or the naan sandwich. I suggest getting one of these. - Water cup is free here... so even though you are eating in a food court, still ask. - The samosas here are pricey, but they do taste more authentic. (sorry not pictured) And. they are baked samosas, so they are a little healthier than other places. - If you are craving an amazing Indian meal, I wouldn't suggest coming here. The food is ok, but it is definitely "Americanized" Indian food. This is one of the well-established Packer/Wisconsin Bars in the city. So bears fans stay away. I came here though after finishing up the OB/Gyn rotation with the other students and it was a good experience. The food was about average and the drink specials were nice and cheap. They offer free popcorn when you sit at a table which was a plus, especially for starving students. The atmosphere was definitely like being in the backwoods of Wisconsin, which was nice. One huge disappointment was not having Spotted Cow Beer. But other than that, it was a decent place, just not for Bears fans. So I chose the cheesesteak sandwich. I wasn't sure what made it "Willy's" besides being served at his restaurant. 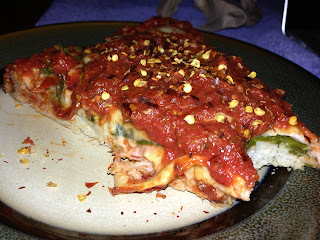 Maybe it was some of the extra vegetable toppings, but I wasn't sure. Anyway, this cheesesteak was made with thinly sliced steak, melted american cheese, roasted red peppers, spinach, mushrooms, and a homemade chipotle mayo. All of it was served on a toasted french roll. The bread was the best choice for all these ingredients. They still fell out, but the sauces and juices were definitely being soaked up by the bread. I really enjoyed the sandwich, but I did wish they used a different, stronger cheese and possibly some sautéed jalapeños or anything that gave it a little kick. One of the other students from the team had this chicken breast sandwich. You can choose from either BBQ, blackened, or buffalo, which he chose the latter. The buffalo sauce was said to be a good heat, but it would be better spicy. He also didn't care for some of the vegetables placed on the sandwich. I wasn't able to try this sandwich either, but he said it was good, just nothing he would "rave" about. It also came with either fries or tater tots... so chose wisely. A couple of the other students on our team got the cheddar bacon burger. They both appeared to enjoy the burger, both finishing them and all the fries or tots that came with them. The burger itself was a half-pound burger topped with spreadable Wisconsin cheddar, applewood smoked bacon, lettuce, and tomato. It was served on a corn-dusted bun. It looked like a good sized burger, especially for the $9. You can choose either tater tots or fries, which I thought the tots were the better option. I personally didn't try the burger but it was recommended by the waitress so it has potential to be one of the better items. - Ask for Drink Specials... This bar does have specials running almost all the time so ask! - Come for Packers Games or Wisconsin Games... this bar is obviously fans of both and supposedly a great place to come watch some football! - Don't come if you are a bears fan. You may not enjoy the atmosphere. - If you want Spotted Cow Beer, don't get your hopes up. They don't have any here... ya its disappointing. 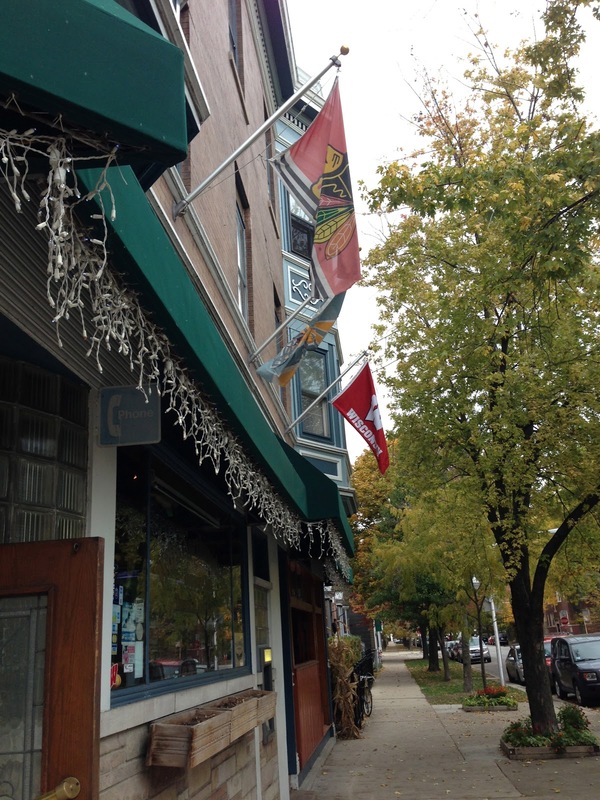 Located right off of the highway, you can tell it is a well-established, historic restaurant in Chicago. People come from all over the city to grab a bite from this hot dog stand. They offer more than just hot dogs however; their Polish Sausage is delicious, but some of the other items are not so great. I refer to them as "onion sandwiches" and you will see why after you look at pictures below, or if you try it yourself. Be aware of the smell that lingers after you eat Jim's. It is always a great idea at the time, but most people regret it afterwards (unless alcohol graces your system). For less than $4.00, you can get one of the better polish sausages in the city and each sandwich comes with fries. Cooked on a flat-top grill, the polish is then kept warm on a bed of grilled onions. They use a steamed hot dog bun with a little bit of mustard, sports peppers, the polish, and of course their signature grilled onions. Sometimes I refer to them as "onion sandwiches" because of the mound of onions the restaurant uses. The onion smell is definitely one of the stronger smells you can notice from two to three blocks away. It is intense but while eating, it is delicious. Beware or be ready for the greasiness you will eat. In terms of the fries, they are some of the best in my opinion! They are always extra crispy. I think they double fry them and the best part is they do that second fry like seconds before they sell them. With a little ketchup, I can actually say I crave these fries and you will not be disappointed. This is the second cheapest item on the menu and one of the best. 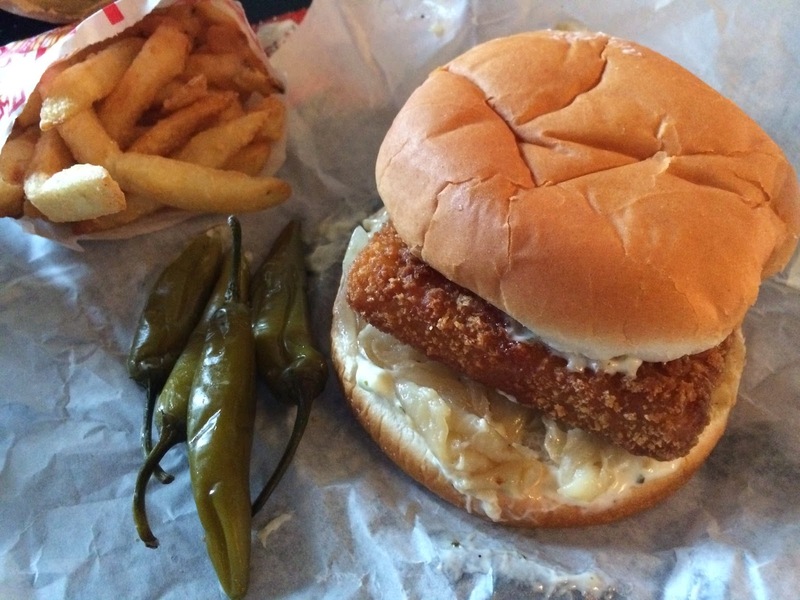 The fish sandwich is fried to order and the hamburger bun is topped with those grilled onions, tartar sauce, a little mustard, and of course hot peppers. The sandwich comes out extra crispy and a wonderful spice. Those acidic hot peppers are a great way to cut the grease of the fried fish. I always suggest asking for a little tartar sauce because they always over do it. As always, french fries are free with any sandwich purchase so enjoy. The one and only vegetarian option at Jim's. 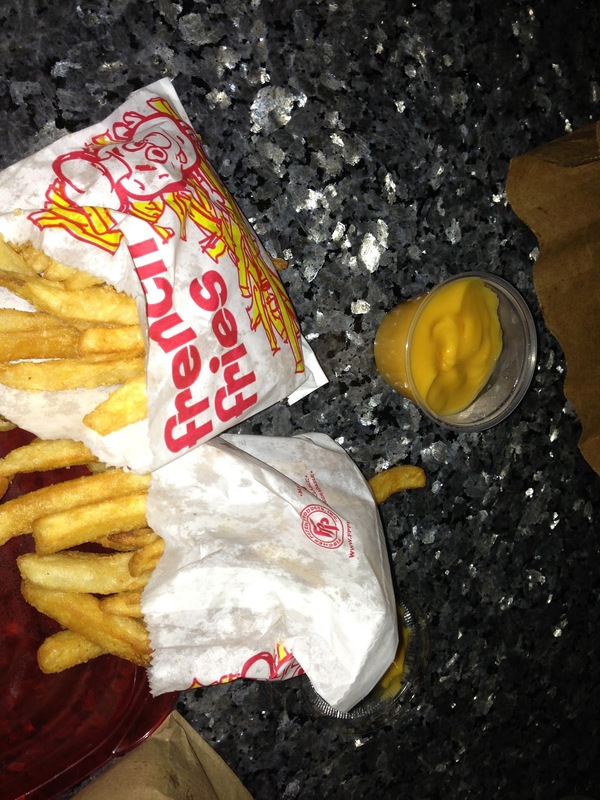 The order comes with two bags of fries, so be careful how many cheese fry orders you order. It only comes with one cup of cheese however, but this is a huge upgrade from when they used to pump the cheese directly on the fries while in the brown bag. It was a hilarious concept (I wish I had a picture) but the cup made it much better. - Excellent place to come after you are done drinking for the night. - Order the Fish Sandwich! It is freshly cooked and somehow addicting. Sorry I haven't pictured it on the blog, but I am sure it will come up soon enough. - If you are going out later that night or have a date planned, do not eat here ahead of time. The onion smell will linger for hours. Location: So many to choose from... I have listed a few below that I have been to and they are all great places to try! 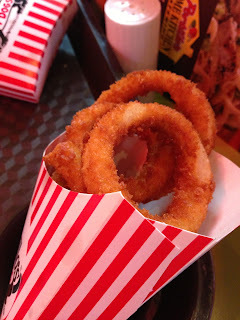 I typically avoid blogging about fast food restaurants, but this is a Chicago great! 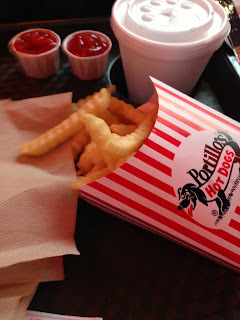 Portillo's is more of a gourmet fast food joint that makes incredible food for a great cost. I describe their food as "Like the Commercial!" Whatever you see on TV, like fast food burgers looking amazing, this place actually lives up to those images. They make incredible burgers, italian beef, and of course the Chicago Style Hot Dog. Also, I find them to be one of the most efficiently run in terms of ordering. They walk to the huge line to take orders or down the drive-thru line to also take orders. A great concept that needs to be adopted elsewhere. Try it out for a not-so-fast-food style fast food place! The best way to describe this incredible "fast-food" burger is: Like the commercial! Basically, this burger comes out how all the other burgers look like on TV. It comes with the typical lettuce, tomato, pickle, and red onion. The bun is great at the start, but it doesn't tend to hold up against all the juices from both burger patties. The charbroiled double cheeseburger is significantly larger than the regular, so I suggest paying the extra buck for the patty The patty's I believe are 1/3 pound each... making this burger a lot of food, especially for lunch. Another Chicago classic! The Italian beef at Portillo's is known by all. But the big beef is much better because of sheer size. It appears to be about 2x the size of the regular, and for only a couple bucks more... its a steal. There are many ways to get your italian beef: dry, extra gravy, dipped, sweet peppers, hot peppers, or mix it all together. I like ordering mine with hot peppers and extra gravy. Sometimes the dipped version is a little too soggy to enjoy. 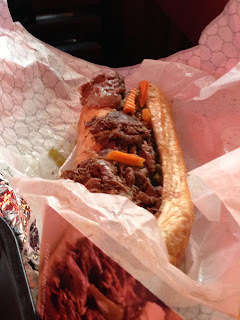 The italian beef is heavily seasoned and very tender. People love this place so much that you can even order the catering sized option. The typical staple of "fast food" dining. They do a great job with their fries because they are not over salted. Making them cheese fries is another idea to try. - Pay the extra couple bucks to upgrade the regular beef to the big beef. Take some home and enjoy it later on. It's worth it! - Do order the Chocolate Cake Shake (Sorry not pictured)... It is an amazing milkshake with at least a huge piece of Portillo's Chocolate Cake mixed right in. But share it because its extremely rich. - If you are ordering Water to drink... ask for a couple of cups. They give super small cups of water and the line to get refills takes way to long. - I don't enjoy coming during peak hours because of how busy it is. Luckily, the downtown location has an upstairs floor for more quiet seating. 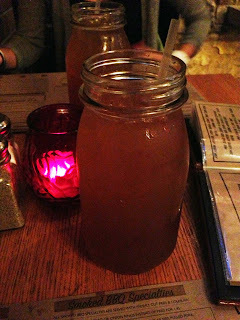 Lockdown Bar & Grill is not one of your typical hamburger joints in the city. With a name including Lockdown, it was refreshing to find that a jail-theme was present throughout. Burgers are named after death sentences and other police patrolling agencies. The atmosphere is intense, with rock or heavy metal always playing in the background. It sometimes gets too loud which is unpleasant if you are trying to have a conversation, but it shouldn't matter because once the burgers appear, no one will be taking anyway. The food is incredible. The burgers are well worth the price in sheer size. They have about a million different toppings to choose from and also offer a build your own mac & cheese entree. The entire concept reminds me of Kuma's Corner, just not as packed. Finally! I was able to try peanut butter on a burger. This crazy creation at Lockdown Bar was a 10oz burger cooked medium (I asked for medium rare)... topped with peanut butter, banana, and of course thick cut bacon. They use a nice pretzel bun which is probably one of the only buns that could withstand the sheer weight of the burger and toppings. You can tell that the peanut butter is added while the burger is still on the grill because it runs down the sides and almost becomes like a liquid consistency. The overall burger was a little overcooked for my liking, but the flavor was awesome. It was sweet because of the banana but I expected that. Unfortunately, after I finished eating the burger, I was disappointed that I didn't have a more savory meal. I was really glad to have tried the burger, but probably won't be ordering it again. One of my friends chose the Arson burger... and by the name, you can probably assume it was extremely spicy. The restaurant tops this burger roasted scotch bonnets, lockdown hot sauce, jalapeño jack cheese, and of course a whole habanero sitting right in the middle. I was able to have a couple delicious bites of this burger. The heat was perfect when starting to eat the burger and it continued to build. Unfortunately, my friend didn't realize the habanero pepper in the middle and thought it was just a bell pepper of some sort. After biting into it, the heat was too intense. I, too, took a bite of the habanero and it was spicy... not as hot as Jake Melnick's Ghost Pepper Challenge, but still enough to make the rest of the burger unappetizing. Minus the habanero, this may have been my favorite burger. Part 1 of "The Flight Risk". This option gives you three mini burgers along with fries. The flight changes frequently, so make sure to ask your server which flight is being featured. This visit, they offered a veggie burger flight. This first veggie burger was topped with goat cheese, sautéed button mushrooms, and a portobello mushroom. My friends really enjoyed the flight, especially this burger! Part 2 of "The Flight Risk". The electric chair burger creation had spicy roasted peppers, grilled onions, blue cheese, and buffalo sauce. It kind of reminds everyone of a typical buffalo style burger with more of a kick from the peppers. Just like the rest of the flight, it was also served on a mini pretzel bun. Part 3 of "The Flight Risk". This is their typical vegetarian option, even though Lockdown Bar will accommodate by making any of the burgers into vegetarian (minus the meat toppings). I have heard people love coming here just for their vegetarian burger. This one was topped with baby greens, cucumber slices, tomato, fried onions, and a shallot dressing. I didn't try this one, but it looked and sounds delicious. For $2.00 more, you can substitute mac & cheese in place of the normal french fries. I thought this was a great deal, so I obviously did and had mine with bacon. It was a healthy portion of mac & cheese and upon first bite, I was reminded of a loaded baked potato or potato skins. The bacon and cheese and chives probably lead me this way. It was a great side and I recommend spending the extra couple bucks it. This is the same idea as the mac & cheese listed above. For the same $2.00, you can also ask them to make it vegetarian, meaning the bacon was not added. They are a very vegetarian friendly establishment which is amazing. The fries here aren't anything special. Typical hand cut french fries seasoned lightly with salt and served with some kind of chipotle aioli. They were good, just a little soggy probably because of take out. 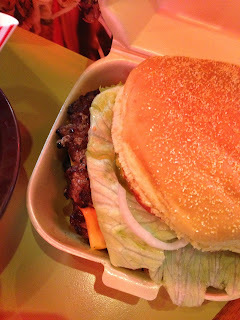 - I really suggest coming here if you are craving a Kuma's style burger... This place doesn't have much of a wait and can easily be ordered for take out. - Also, be sure to ask about the burger flight... they rotate which burgers are featured and it is probably the best deal at the restaurant. - The staff here gets kind of annoying. They are all about fast pace so eating and leaving. So if you are trying to have a nice longer meal, don't eat here.